It is very rare in this era of worldwide big-business tourism that you get to see what the world’s famous tourist sites were like before the advent of airplanes, tour buses, parking lots, and gift shops. We can only imagine when the pyramids, the Acropolis, or the Great Wall of China were approached without first passing through a gauntlet of tourist stalls, bus-filled parking lots, and hordes of picture-snapping tourists. That’s why when I heard about a small Nubian-owned company that organizes sailboat trips down the Nile I knew this might be my chance to experience something that would take me back in time to an era of tourism that hasn’t existed for many years. We took off from Elephant Island, seven of us on Captain Jamaica’s six-person boat (called a “felucca” in Arabic). With the five other people aboard, my mother and I passed pharaonic temples and ruins off the beaten tourist path as we traveled north down the Nile. Floating out from the docks at Aswan, we spread ourselves on the deck of the small boat like seals in the sunshine and lazily hung our feet in the water. As the wind pushed us slowly down the Nile, we passed farmers and their oxen as they plowed their fields, small mud-hut villages with naked children playing in the water or waving at us, and women pounding their wash in the muddy water. Occasionally we were passed by a large cruise ship full of tourists loudly motoring up the Nile to disembark at one of the larger archaeological sites. These ships were complete with swimming pools, dining rooms, and satellite TV for the tourists who didn’t dare leave the comforts of home behind. They would look at us curiously from their decks as they passed by, some of them taking pictures of us. I imagine they were wondering what kind of crooked tour guide had tricked us into getting onto a small dinghy without so much as a toilet. Once they passed, we were again enveloped by beautiful silence, sunshine, and idle conversation as the wind and current swept us past papyrus-lined banks. Small waves lapped up against our hull like the soothing beats of a drum. During the day we stopped at magnificent temples with colorful hieroglyphs and columns carved with ancient stile, and statues of pharaonic rulers and gods staring down at us with expressions of haughty indifference. We docked at most sites either in the early morning or just before sunset and were able to walk around by ourselves as if discovering them for the first time. It was at these times that a shared sense of awe and wonder overwhelmed us in ways we’d never felt when surrounded by throngs of jostling tourists clicking their cameras, tour guides with loudspeakers, or pushy salesmen hawking their trinkets. Dinners were prepared on a small fire built by Captain Jamaica on the bank of the river. Some nights, the captain and the two-man crew would pull out a drum and tambourine and we would dance and clap to the beat. Locals from a nearby village would stop to smoke and gossip with the crew. Afterwards, we spread out our blankets on the deck of the boat and slept under the stars, lulled to sleep by the slow rocking of the current. As our journey came to an end, I took a long last look at the river that over the past four days I had come to build a relationship with. Living in Cairo, I had seen the Nile as no more than an open sewer, something to quickly cross over on my way to somewhere more important. Yet on this boat, floating just three inches above its surface, I had come to associate it with the landscape it passed through. There were people working the land just as they were depicted on the walls of the temples thousands of years ago, with the river as a living artery through a barren desert. 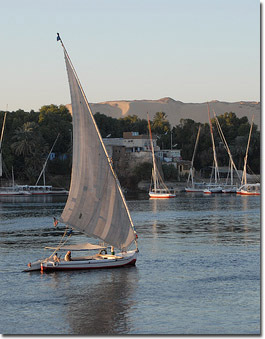 Captain Jamaica Felucca tours are run out of Aswan, Egypt. They’re largely by word of mouth, and you can arrange one in person on Elephant Island.